Don’t be fooled by cleaning companies who claim to be green but use commercial cleaning products that contain petroleum, chemical preservatives, artificial fragrances and colorants. 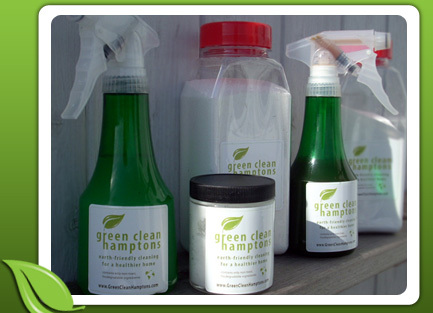 Green Clean Hamptons uses only non-toxic, biodegradable, organic ingredients in our homemade cleaning supplies. Our products are petroleum, preservative, and colorant free and we fragrance with organic essential oils like orange, lemon, lavender and eucalyptus. At Green Clean Hamptons green is not a marketing gimmick, it’s a way of life. NEWS: We are pleased to announce that we are now serving Westhampton Beach! Call 631-6032-2796 or Contact Green Clean Hamptons to Schedule Your Organic Spring Cleaning Now. Our cleaning crews will give your house a thoroughly Green Spring Cleaning using our 100% organic, homemade cleaning supplies. vinegar; peppermint castile soap; castile soap; eucalyptus, orange, and lemon essential oils; baking soda; lemon juice; salt; liquid-organic-base soaps and tea tree oil, black tea, lemon juice. The only commercial products we use is Bon Ami cleanser (is and always has been nontoxic and biodegradable) for tough scrub jobs. Our products are safe for your children, pets and co-workers. We take great care to ensure that we purchase all ingredients from eco-conscious suppliers and retailers.